That one word is guaranteed to bring a smile to most people’s faces. Are you smiling right now? I think brownies makes us smile for a few reasons, but mostly because they make us feel childlike and nostalgic, and they have chocolate in them. Most people like chocolate. I admit it, I am a chocoholic. I eat chocolate regularly and I like to share it with others. 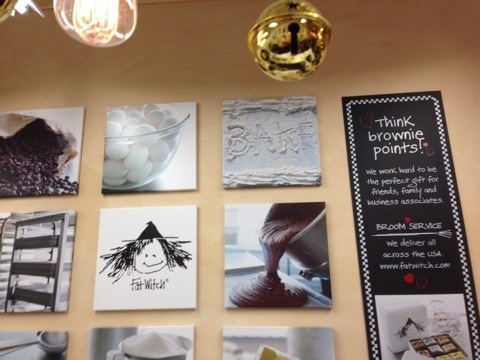 Milk chocolate is my favorite – alone, drizzled on top, mixed inside, it doesn’t matter. Chocolate can be as simple or as complicated as you’d like it to be; its versatility is what I think adds to its appeal. Brownies have always been a household favorite and they were one of the first things I learned how to bake as a kid. 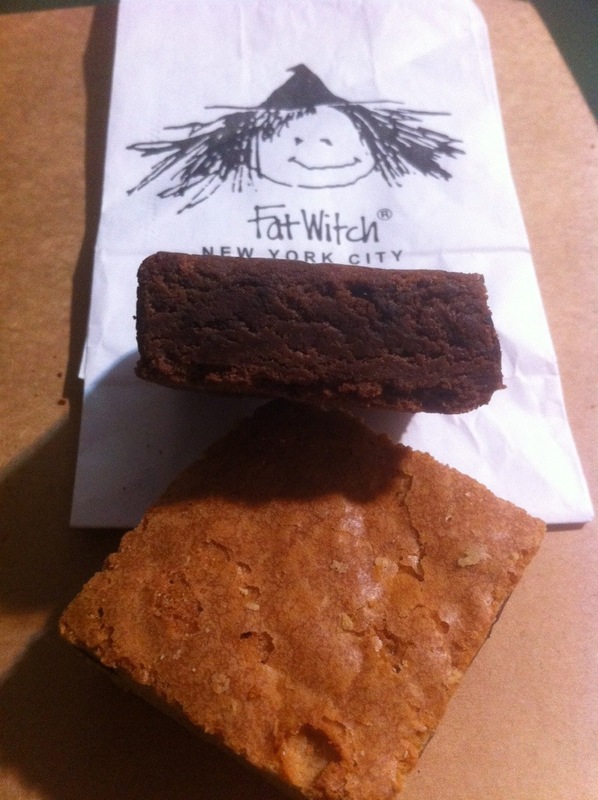 In honor of one of my favorite sweet treats and National Chocolate Day, which happens to be today, I must tell you about these classic and very excellent brownies and blondies we found in New York City. My husband and I visited NYC the day after Christmas to see the Rockefeller tree, have lunch, and explore Chelsea Market. 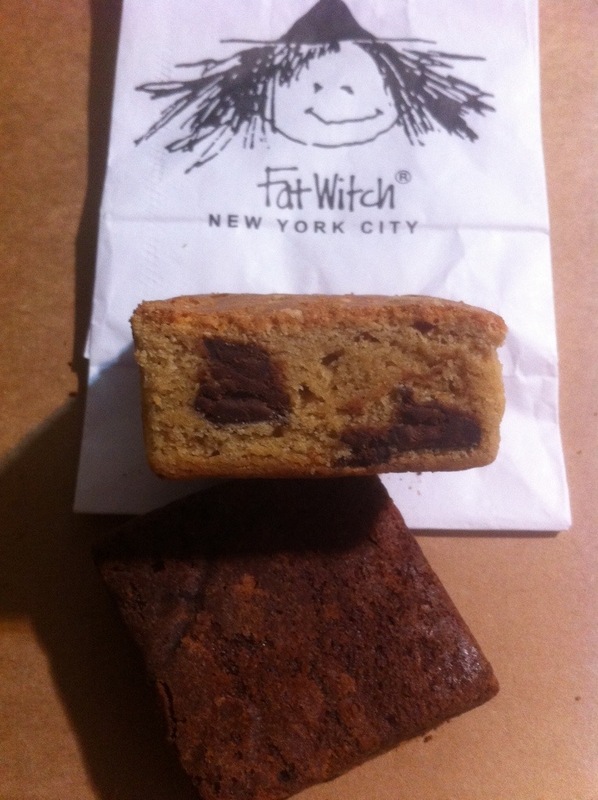 In Chelsea Market we discovered Fat Witch Bakery, a bakery that sells brownies and their brownie mix. 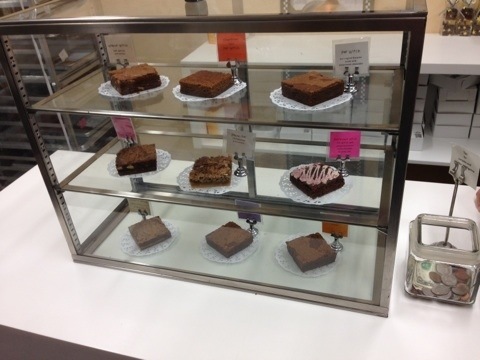 The brownies are made fresh daily without any preservatives and using all natural ingredients. 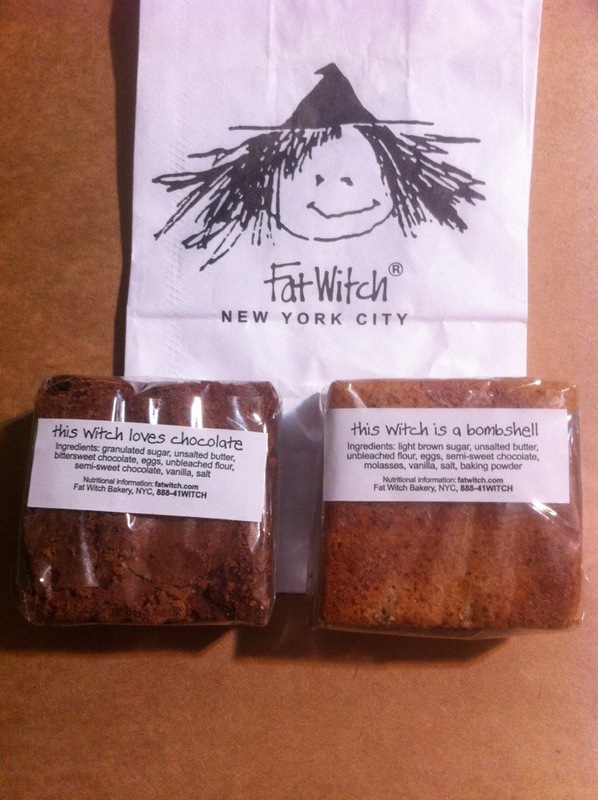 My husband was very excited to try Fat Witch’s blondie aka “Blonde Witch” and I went with an employee’s recommendation to try his favorite, the double chocolate aka “Double Chocolate Witch”. Made with semisweet chocolate and bittersweet chocolate, granulated sugar, unsalted butter, eggs, vanilla, salt, and unbleached flour, the Double Chocolate Witch is very chocolatey and decadent. You will be able to taste both the semisweet and the bittersweet chocolate. These brownies are dense, slightly crumbly, and chewy. 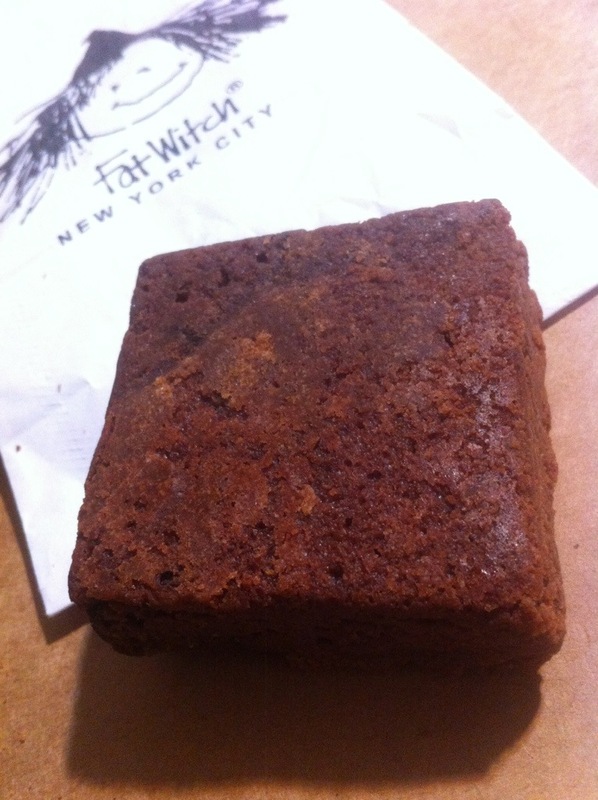 As my husband said so well in between bites and oooo and ahhh sounds, “I am automatically reminded of a true homemade brownie from scratch that I had as a kid at school bake sales!” I have to warn you, a glass of cold milk is needed to go with Fat Witch brownies! TIP: If you like a very gooey brownie, then these brownies are not for you (and I suspect this is why there have been negative reviews online). The words, “chocolate chip cookie brownie from heaven,” might have been uttered while eating this blonde. 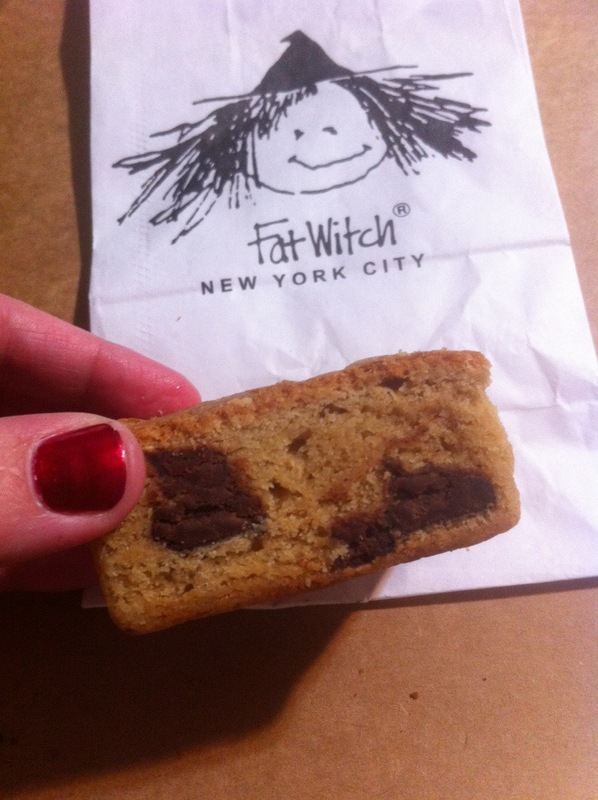 And that is the best way to describe a blonde – a chocolate chip cookie meets a brownie. 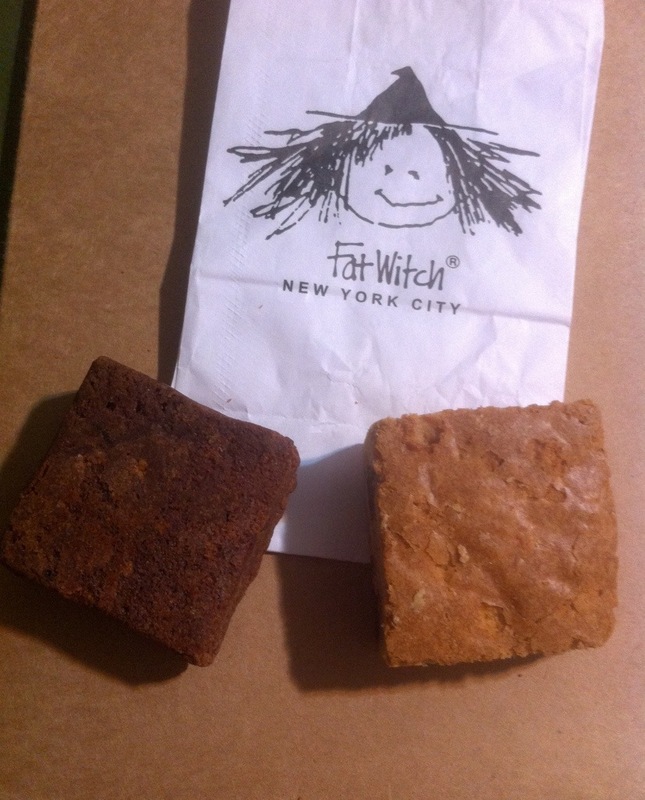 Made with light brown sugar, unsalted butter, unbleached flour, eggs, salt, vanilla, baking powder, molasses, and semi sweet chocolate, the Blonde Witch is soft and chewy and dense. You can taste the brown sugar and semisweet chocolate. I suspect the Blonde Witch would go well with a scoop of ice cream. 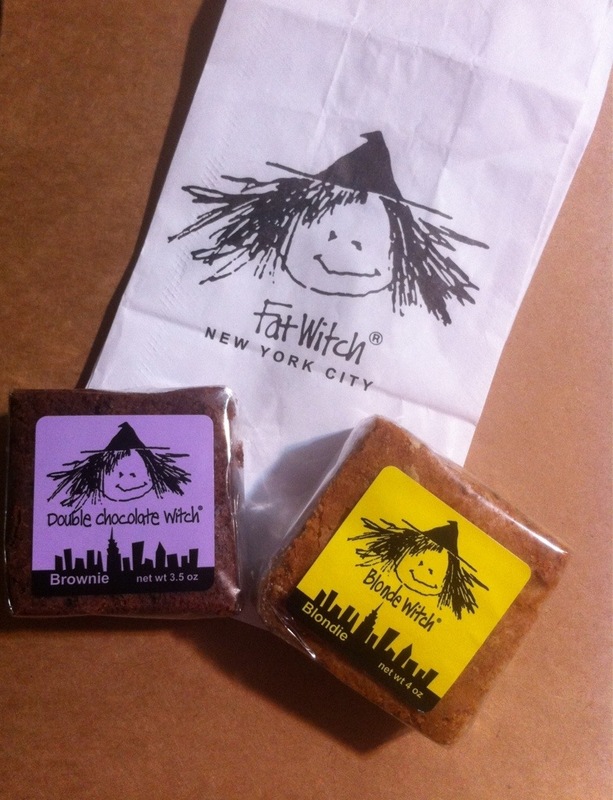 Fat Witch Bakery brownies are available to order and ship on their website including gift packages that you can customize. 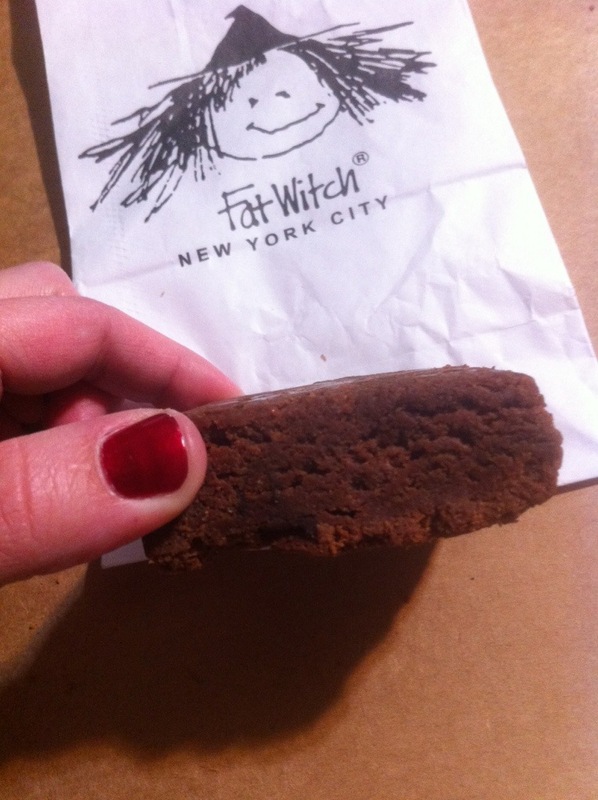 Some other products you can find on the Fat Witch site are brownie mix, hot cocoa mix, and witch ends – the edge of the brownie that touches the edge of the pan (I think this is brilliant! ).